The Maryland National Guard takes great pleasure in recognizing its citizen-soldiers and airmen who have interesting qualities and stand out in their military and civilian careers. This quarter, the MDNG would like to acknowledge Army Staff Sgt. 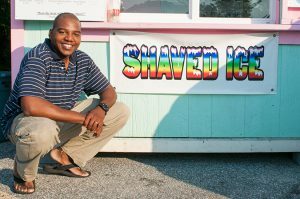 Kenneth T. Smith for his outstanding work as a full-time program analyst with the Maryland National Guard and as a successful entrepreneur. PAO: So what do you do for the Maryland National Guard? Staff Sgt. Smith: I’m a full-time program analyst for the Maryland National Guard, in the human resource office and I’m also a military police officer with the 29th Military Police Company. PAO: What does your full-time job as a program analyst entail? Staff Sgt. 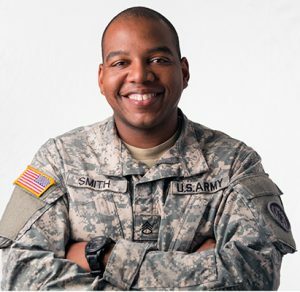 Smith: As a program analyst, my primary function in the Human Resource Office is to maintain the Maryland National Guard’s tech-pay budget, which is roughly a 33-million-dollar budget to cover down on the technician’s pay in the whole state of Maryland. I also assist the chief of staff, general officers, and manage the budget for the AGR (Active Guard Reserve) and tech travel for the whole state of Maryland. PAO: How long have you been a program analyst? Staff Sgt. Smith: About five years. PAO: Ok. What do you do on the civilian side? PAO: Has your business supported the Maryland National Guard in any way? Staff Sgt. Smith: Yes, I actually do a lot of family-day events for the Maryland Army National Guard – Joint Force Headquarters being one of them. PAO: How long have you been offering shaved ice, with over 50 plus flavors, to all of the friends, family and fellow citizen-soldiers of the Maryland National Guard? Staff Sgt. Smith: Probably for about three years now. I’ve also been doing Unity Day as well every year for the past five years. PAO: So what made you want to become an entrepreneur and own your own shaved ice service? Staff Sgt. 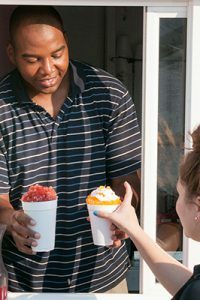 Smith: Well (chuckle), it’s funny because when my wife and I were in high school, we actually worked at a snowball stand together. I wanted to start out as a stationary stand, but that didn’t happen. But it came to me to do mobile, so I can move around. But on July 1st, I just opened up my first stationary stand in Glen Burnie. PAO: Wow! So how’s that working for you? Staff Sgt. Smith: So far, so good; foot traffic has been picking up everyday. We’re open from twelve to eight and it’s just about building the trust of the community and just continually providing that quality service that we do when we do these individual events. PAO: Do you run the whole business yourself? Staff Sgt. Smith: No, my whole family is involved. My sister is involved, my in laws, my four sons and my wife. Not so much my wife now, because she has her own bakery. My wife has been doing designer cakes for well over 10 years now. PAO: So, it’s a family affair? Staff Sgt. Smith: Yes, it’s always some one moving in the house. We don’t even bother to have cable because we’re always doing something (chuckle). PAO: So, what makes you want to continue with Xtreme Snow? What’s your motivational drive? Staff Sgt. Smith: Honestly, it’s the smiling faces I see and meeting new people from all over the MD/DC/VA area. PAO: Do you feel being a program analyst for the Maryland National Guard helps you with maintaining your business? Staff Sgt. Smith: Absolutely. It teaches me how to stay disciplined financially. It teaches me how to make key decisions. Knowing how to be proactively instead of being reactive definitely helps me in the entrepreneurship world. PAO: What are your future plans with the Maryland National Guard and your business? Staff Sgt. Smith: To retire from the Maryland National Guard and expand my business across the East Coast.